1. Create a warm welcome for your guests right at the entrance. Green and a touch of red will put the tone. You can go for the classical wreath, I'm sure your local flower shop will have some in their offer right now. In case you have still some free time, or you love to do creative things: go to the market or flower shop and buy different green branches, add some dried flowers, ribbons and you will have the greatest entrance in the street. 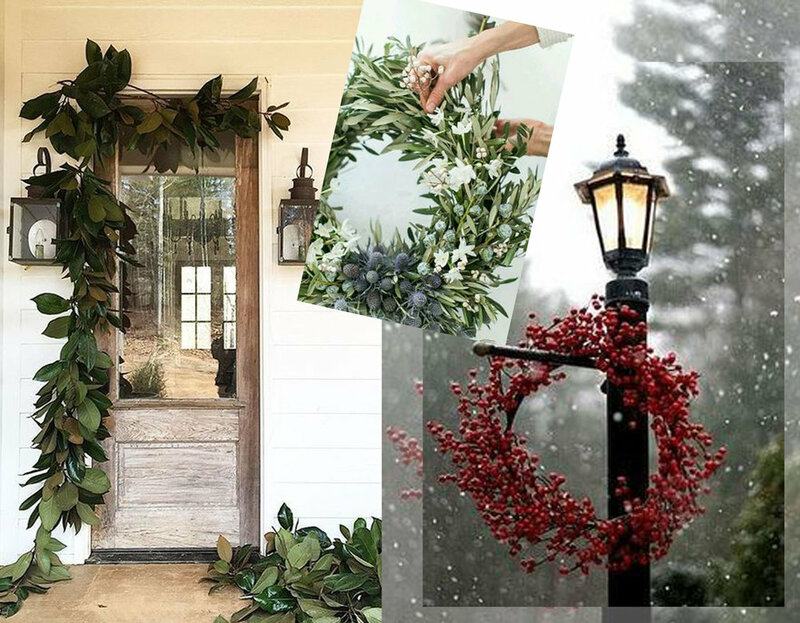 You are more a minimalist type but you want to do something extra for Christmas: a simple garland of big green leaves will make a statement. Ever tried a stovetop potpourri? Try this recipe for a cranberry and cinnamon stovetop potpourri from Rachel Schultz, and surprise your guests with this amazing Christmas scent, from the moment the entrance door opens. Atmosphere is everything when it comes to Christmas decoration, filling your home with a wonderful holiday scent can be one of them. Dried orange slices, orange peel, cinnamon, are typic for this time of the year. No Christmas tree yet? 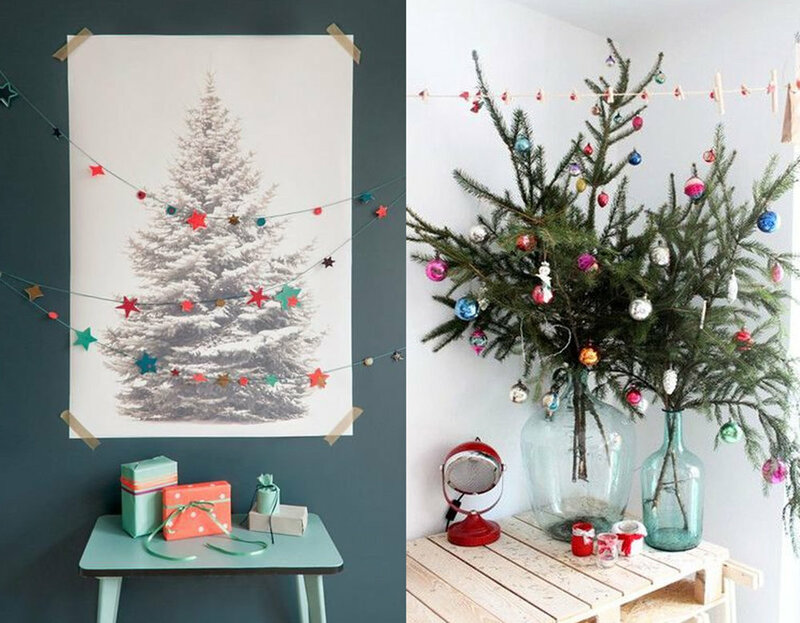 There can be different reasons: your apartment is to small, a nice Christmas tree can be expensive, not to think of the decoration, or you will be traveling. So no reason to start decorating one, or you simply don't want to cut a tree to have it only for a few weeks in the house and throw it out afterwards. But we all agree: Christmas without a Christmas tree is not the same. Did you once think of printing one and decorate it in a 2D way? Not wanting to purchase a full tree but still looking for that authentic Christmas scent in your home? Put some branches in a big vase and you are sure to leave your home smelling pine fresh. In case you missed my blog post a few weeks ago about wrapping gifts: take a look, and get inspired. I told you already keep it simple, and I mean it, don't look for fancy wrapping paper. You don't have to go for brown craft paper if you think your family will not appreciate it. Once you decided on the color of the paper: green or red, white or gold, you can choose the ribbon. Wide satin ribbon for a touch of glamour, red and white striped ribbon will give it an authentique look. Add a nice gift tag, get in the garden and cut some green leaves, add a feather, some stars, flowers, .... just look around in your home and I'm sure you will come up with more than 3 ideas. We should not forget about the star, they are often used as symbol during the Christmas season. Beautiful just as a decoration item and it will remind us of the story of Jesus' birth. Let the stars shine, add them in your tree, fix some above the table or at the window. Go green with some mini Christmas trees, you can eventually plant them after the snow melts and you will have a Christmas tree for years to come. Put some small branches in vases , bottles or in transparent christmas globes for a modern look. Candles are a in winter as they create a warm ambiance, even more for Christmas. Create some ice candle holders for your garden, or at the entrance. Candles do well everywhere. A must on the dining table, above the open fire, or a special decorated corner in the living room. Scented candles can be wonderful in the living room but take care not to use them on the dining table as there scent can be strong and will overtake the aroma of the food. Color wise? I would go for white, but depending on your overall color theme you can opt for red, green, gold. I always like to combine different candle holders, and so to play with the height of the flames. Attention not to put it close to something which can catch fire, you can't be careful enough. At Christmas we decorate the Christmas tree with a lot of attention for the details to create a beautiful spirit. 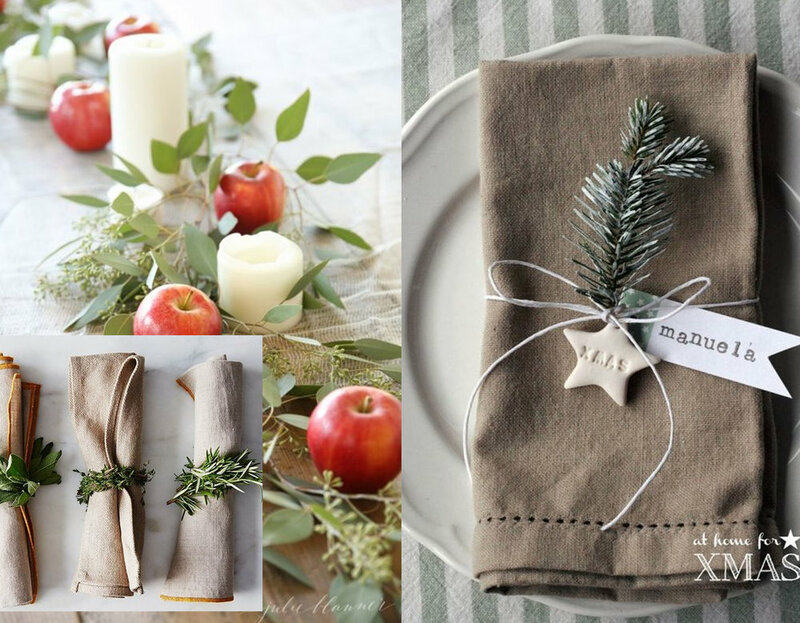 The table decoration for the Christmas dinner is as important as the food itself. If you want a touch of glamour than you should add some gold for the best result. 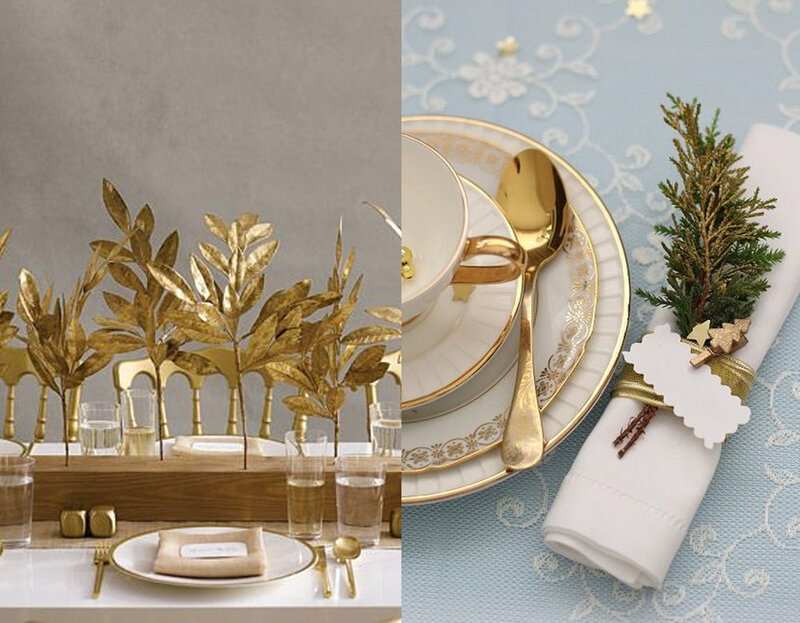 A beautiful decorated table is not about spending a lot of money on formal objects. Go for simple but stylish. I see endless opportunities for nice linen napkins. Some green out of the garden can give it a festive touch. Use name tags if you have a lot of guests. Christmas globes can be used to create a center piece on the table as well, but why not using some red apples instead? Simple cookies, gingerbread, panettone, to talk about just a few of those typical delicious Christmas sweets. They can be used at the same time to make some delightful designs. Make some more so they can be a perfect hostess gift when you go and visit some family.